Founded in 1865, Lehigh University is a private residential research university in Bethlehem, Pennsylvania consisting of four colleges. More than 5,000 undergraduate students and nearly 2,000 graduate students attend the school. Foil Stamped Letter Size Two Pocket Folder with 1 foil stamped area on uncoated 100lb mahogany smooth linen stock and H1 business card slits on the right pocket. 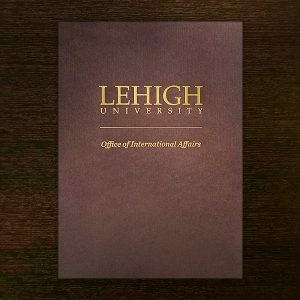 Emily Groff, Director of Communications and Marketing at Lehigh University, needed presentation folders to hold printouts and brochures for the university’s visitors and meetings in a brown stock. With these particular folders slated to for a large part of her budget, she had little room for error. 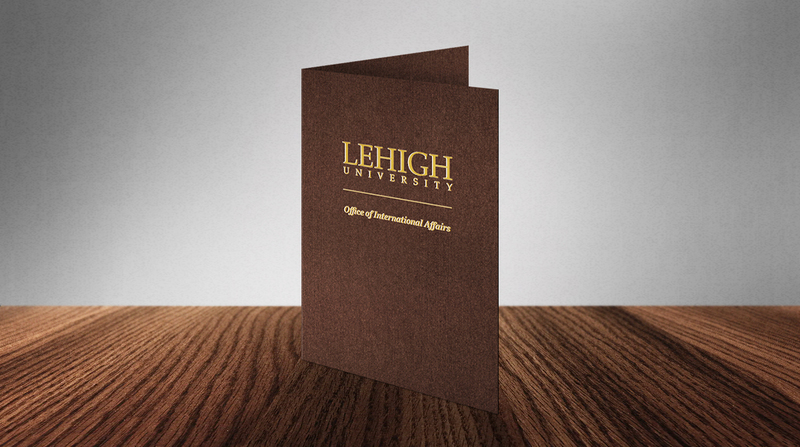 Groff couldn’t find a stock that matched Lehigh University’s school colors. Groff was able to purchase 500 presentation folders in a stock that matches the university’s brand. She said until she found Company Folders, she could only find white, cream and shades of gray, which wouldn’t work. The product she selected is available in 60 paper stock options, which includes four brown stocks, each with its own shade and texture. It has 24 foil stamp metallic and non-metallic color options, including four metal-based colors that complement a brown stock, making it easy for Groff to find something perfect for her needs. Before ordering, Groff wanted to check on the quality of the stocks and imprints Company Folders offers, so she requested stock samples of the 100lb mahogany smooth linen and 100lb sterling gray linen stocks. The sample packet, which also included a swatch of foil colors, was shipped out the next day and reached her two days later. Satisfied with the samples, Groff created a design and uploaded it to the website to start the ordering process. Members of our team check artwork at each step of the process from design to printing to ensure it is print-ready and will produce the best product possible. In Groff’s case, Print Project Director Jennifer Grubb caught an issue with her artwork and informed Groff that she needed to submit a vector image. Groff’s folders would not go to print with this issue, saving her budget and a headache of reprinting. And the final product did not disappoint, either. “I love the metallic foil. We chose the brass, and the matte finish looks so sharp,” she said. This particular foil and stock combination provides the design with both a visual and tactile contrast. The lustrous brass color stands out against the dark brown stock with a shine that bounces off each letter as it is moved in the light. “The stock is nice and heavy, too,” Groff said of the 100lb mahogany smooth linen stock, which has a texture look similar to woven linen. Its rich, earthy brown color evokes feelings of calmness and warmth. It is thick and durable to keep contents protected from damage. “I was impressed with the quality of the product, and the variety of options for stocks, printing, finishing, etc.,” Groff said. She wasn’t the only one impressed; she said her supervisors and co-workers also loved the folders and can’t wait to use them.